With seven seas surrounding the region, including the Mediterranean, the Persian Gulf, the Gulf of Aden, the Red Sea, the Black Sea, the Caspian Sea and the Arabian Sea, the Middle East is not short of sources for fresh seafood. However, total production in the region amounts to only 2.17% of the total worldwide production. Capture fisheries are characterized by a large number of small-scale fishers, with it estimated that the small-scale sector provides about 80 to 90% of the total landings. Since 1961, fish production has been gradually increasing at a growth rate of 16%. Egypt is the biggest producer in both capture fisheries and aquaculture, supplying 40% of the total production in the Middle East. This is followed by The Islamic Republic of Iran (21%), Turkey (19%), Yemen (6%), and Oman (5%). Kuwait, Qatar, Syria, Lebanon and Jordan are the lowest producers. As in the rest of the world, aquaculture’s contribution to the Middle East’s total production has grown. This trend is stronger in the Middle East than in many other parts of the world. Indeed, in 2001, out of a total of 2.4 million tones in the Middle East, 78.6% was from capture fisheries while only 21.4 % was from aquaculture. In 2011, out of a total of 3.4 million tonnes, 56% was from capture fisheries while 44% was contributed by aquaculture. The main aquaculture producers in the region are Egypt, Saudi Arabia and The Islamic Republic of Iran. In 2011, 72% of all production in Egypt was from aquaculture, while Saudi Arabia and The Islamic Republic of Iran produced 41% and 33% from aquaculture respectively. These aquaculture productions are mainly used for domestic consumption. In terms of species, fresh water and diadromous species make up 46% of the fish species produced in the Middle East. This is mainly due to the aquaculture production in Egypt. In 2011, Nile tilapia production from Egypt contributed to 18% of the total fisheries and aquaculture production in the Middle East at 610 000 tonnes. Interestingly, if Egypt is not considered, small pelagic species such as sardines, anchovy and mackerel are the highest produced species in the Middle East. Overall, production in the region is lower than demand. To improve this situation, government support of aquaculture production has been growing. In 2013, the Saudi Arabian Ministry of Agriculture and Fisheries said it would provide USD 10.6 billion for aquaculture projects with the goal of producing one million tonnes of fish in the next 16 years. Similarly, the Sultanate of Oman announced it would provide USD 1.29 billion for fisheries development. The Ministry of Environment in Doha, Qatar, also has plans to boost production and is building a large fish breeding farm and research centers. The Middle East, especially the GCC (Gulf Cooperation Council) region (Bahrain, Kuwait, Oman, Qatar, Saudi Arabia and UAE), has seen a substantial rise in per capita seafood consumption. The average per capita consumption for the Middle East in 2010 was 9.9 kg per year. When taking only the GCC region into consideration however, the average per capita consumption is significantly higher at 14.4 kg per year. In the United Arab Emirates (UAE) and Oman, seafood consumption is one of the highest worldwide, estimated at 28.6 kg per year. Other countries in the region, such as in Qatar and Egypt, also have high seafood consumption at 24.5 and 20.8 kg per year respectively. Overall, small pelagic fish such as sardines and mackerel and large pelagic fish such as tuna and barracuda are the most highly consumed species throughout the Middle East. Freshwater species such as tilapia and Nile perch are also popular and consumed significantly by the Egyptians, Iranians and the Iraqis. 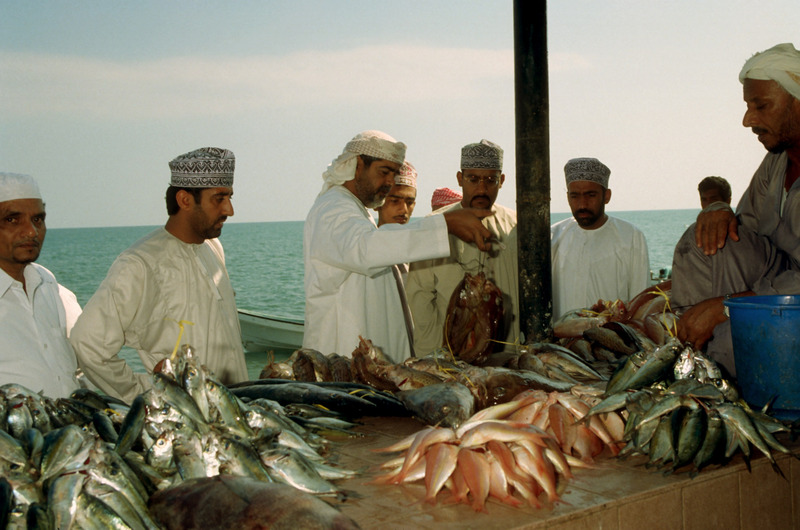 The richer oil producing GCC states highly value their local demersal species such as grouper, travelly, emperor and pomfret. Imports of high value seafood products such as scallops, shrimp, lobsters and caviar have increased as a result of the growing economy and tourism sector. As in other parts of the world, consumers in the Middle East are increasingly purchasing their seafood from supermarkets and shopping malls. Though not widely available, online fish retail stores are also a growing market presence, and work to deliver seafood directly to households in metropolitan cities such as Dubai. Government participation in marketing and trade is limited. The exception is in Yemen, where the government holds strict control over production, marketing and pricing of fish. Since 2004, it has been mandated that all fish sold in Yemen be sold through official auctions where the government levies a 3% charge plus another 5% service charge on the gross sale value. In other places such as Qatar, Iraq, and Oman, the government has a suggested pricing model in place. In Oman, hen the catch for locally consumed species, the government will enforce strict export controls to maintain the local supply. Fish and fishery product exports in the Middle East are minimal when comparing with the major global players. In 2009, USD 882 million exports were from the Middle East, which was only 0.91% of the global value. Nevertheless, Middle Eastern exports are growing, especially after the 1990’s, when the average growth rate reached 16%. Pelagic fish such as sardines, anchovies, sprats and mackerels are the most exported products from the Middle East. Yemen and Oman, which produce 6% and 5% of the total fisheries production in the region, are the leading exporting nations in the Middle East by volumes. Both countries have long coastlines, a very active fishing sector and low populations, resulting in high excess production that is then exported. Turkey and The Islamic Republic of Iran are the other major exporters. Though Turkey does not export as much in volumes as Oman and Yemen, their export market is valued higher than both. This is mainly due to the fact that the country exports higher value species such as seabass, seabream, trout and bluefin tuna to Europe. Middle Eastern countries affiliated with the GCC impose very low import tariffs (i.e. 0–5 percent), and as a result, inter-regional trade is strong. Currently, eight countries in the Middle East are allowed to export to the EU, including Egypt, The Islamic Republic of Iran, Oman, Saudi Arabia, Yemen, Turkey, Israel and UAE. Combined imports in the Middle East is approximately three times greater than combined exports, with the volume of imports having increased at an average rate of 12.3% since 1980. In 2009, the fisheries import market in the Middle East was worth around USD 1.7 billion occupying 1.69% of the global value. Countries in the region with large populations and strong economic growth are the biggest importers. Egypt has been one of the drivers of this growth, as the country has shown an average import growth rate of 12.8% from 1980. UAE has also played a significant role, as it has experienced an annual growth rate of 33.6% since 1999. Egypt, UAE and Saudi Arabia combined make up 62% of all the imports of fish and fishery products in the region. Fisheries and aquaculture production in the Middle East is relatively small and remains under developed. Production from the region amounts to only 2% of the total world production. Major producers are Egypt, The Islamic Republic of Iran and Turkey, with Egypt being the largest producer as well as the largest importer. Oman and Yemen are the main exporters in the region, exporting more than half of their production. The major importers are Egypt, Saudi Arabia and UAE. UAE, Saudi Arabia, Kuwait and Qatar import several times more than what they produce making the Gulf Cooperation Council states (GCC) a highly import dependant region.